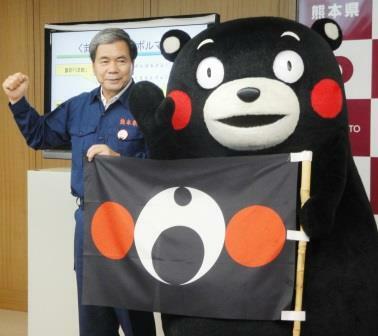 Kumamoto Prefectural Government unveiled a “logo mark of Kumamoto’s recovery” on June 15, which is expected to be a symbol of restoration and recovery from the damages by the earthquake which heavily struck the Kumamoto region on the island of Kyushu this April. which is the prefecture’s PR mascot character, one of most popular “yuru-charas” (literally, loose characters) in Japan. The banner is expected to play a role as the leading proponent of reconstruction of the quake-hit Kumamoto areas. The designers of the logo are Kundo Koyama, a broadcast writer and an originator of the mascot character “Kumamon,” and Manabu Mizuno. Companies and businesspersons in the prefecture will be allowed to use the logo by next March.